Samsung Galaxy S3 Philippines Release Date, Confirmed! Pricing Details to Follow, But We Have a Guesstimate! I've just received a text message from one of our friends at Samsung Mobile Philippines confirming (what our industry insider told me the other day) that the Korean company's 2012 flagship smartphone, Samsung Galaxy S3 GT-i9300, will indeed arrive in our country by the last week of May 2012. 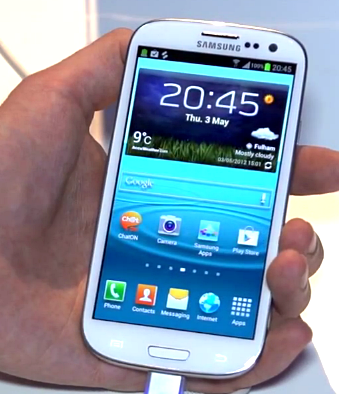 Learn more about Samsung Galaxy S3 i9300 and check out our SGS3 vs. SGS2 specs comparison table. During SGS3's official announcement at Samsung Unpacked event in London last Friday, Samsung reps mentioned that the handset will become available in Europe starting May 29, 2012 while other territories will get it around June this year. From the looks of it, the Philippines could very well be one of the first countries outside of Europe to receive the smartphone. Now, isn't that nice? If you remember, Pinas was also one of the first to get Samsung Galaxy Note last year. In fact, Samsung is currently just starting to introduce SGNote in the US while - as you all know - the phablet has been available locally since November 2011. I don't really know if this is simply part of Samsung's worldwide sales stragery or if it's because they see the Philippines as a key or a 'very important' market for their smartphones. Either way, Pinoy Samsung fans should be glad that they get to experience all the goodies ahead of the others. Now, as for the Samsung Galaxy S3's actual suggested retail price, believe me - I did my best to get an inside scoop -- to no avail. "[...] No SRP yet available," our friend told me via SMS. Nonetheless, I'm expecting the phone to don an introductory price tag of around Php 30,000, similar to that of Samsung Galaxy S2 i9200 - last year's flagship - when it was launched in the Philippines on June 20, 2011. So are you getting your SGS3 during its launch this month? What do you like most about it?